Make soften the gelatine putting it in water, wring and dissolve in 2 spoons of warm water. Blend the glance of tomato with the gelatine, sesaon with tabasco, a pinch of oregano, salt, pepper. Finally add delicately the whipped cream. Systemize the mousse in little pyramidal moulds and put them in refrigerator to cool. In the meanwhile mince the dried tomatoes to use like decoration. 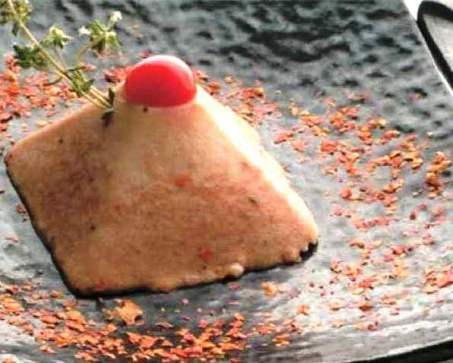 Put the pyramids of mousse in the dish surrounding with the minced dried tomatoes. Put on the top of every pyramid a tomato “ciliegina” and decorate with a leaf of basil. Serve as appetizer.